Anthony Quin, the subject of my photograph of the cop and the five-year-old-kid, died on Monday from the effects of Pancreatic cancer. He was fifty-five. The funeral will be in St. Petersburg on Saturday. He had been in hospice for some weeks, so his demise was not unexpected, but it left me feeling low. Apparently he was already dealing with the cancer at the time of the Freedom Summer celebration, although he looked so great and spoke so well. I'm waiting for a call from Deanne Quin, his wife, who wants pictures of Anthony to show their kids. I'll get prints to her in time for the funeral,and I'm thinking about approaching the NY Times about an obituary. His is such a classic story of the problems and trajectories of young black males growing up in 60's Mississippi, (think Ben Chaney) and his ultimate success could be a teaching for Times readers. Anthony grew up in McComb, Mississippi, the heart of KKK country in those days. His mother, Ayleen Quin was a prominent civil rights leader, and a month before my picture was taken, her house was firebombed and the ceiling of her front bedroom fell on young Anthony, who was sleeping there. This may have been Anthony's first exposure to civil rights, but it certainly wasn't his last. He and his sisters were the first black kids to integrate McComb public schools two years later, and Anthony had no pleasant memories of those years. He told me it seemed like he had a fist fight every day he was in school, either defending his sisters or himself. He was an angry, troubled child, but a very bright one. He read vociferously — anything from his mother's encyclopedia to every book he could get his hands on. He was expelled from school frequently, and by his first year in high school, was facing juvenile detention — a fate his older sister saved him from by removing him to Chicago to live with her family. Other chapters are too numerous to recount in this email, but include studies as a percussionist at the American Academy of Music in Chicago, a two-year stint on the road with a rock band, and finally a more settled life in Tampa, Florida where he became manager of a business, and then returned to school, getting an BA, an MA, and finally a PhD in education administration. He married and had two kids, became Vice-Principal of several elementary schools, and then Principal of several others. He was well embarked on a career as an education administrator when he came down with pancreatic cancer. He died last Monday, and his funeral is today in Tampa. I reunited with Anthony in Jackson, Mississippi in June, 2014 during the 50th anniversary celebration of Freedom Summer. Together we narrated a tour of my photographs of that 1965 event, at the opening of a show I curated: "This Light of Ours: Activist Photographers of the Civil Rights Movement" at the Mississippi Museum of Art. I think Anthony deserves a New York Times obituary. While it's true he was never a "prominent" person, the trajectory of his life from a troubled beginning in the crucible of civil rights to a successful career serving young children in Florida, is an interesting story, and perhaps provides insight into what could happen to a young black male in our society. Oftentimes we want to know what happened to the people in iconic photos. Such is the case of the young boy in the picture above. 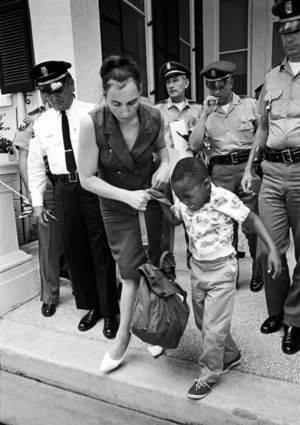 Wayne "Anthony" Quin was five years old when he went with his mother to a demonstration at the Mississippi Capitol in 1966. The policeman tried to take his picket sign and he refused to give it up because his Mother had told him to not allow anyone to take it from him. 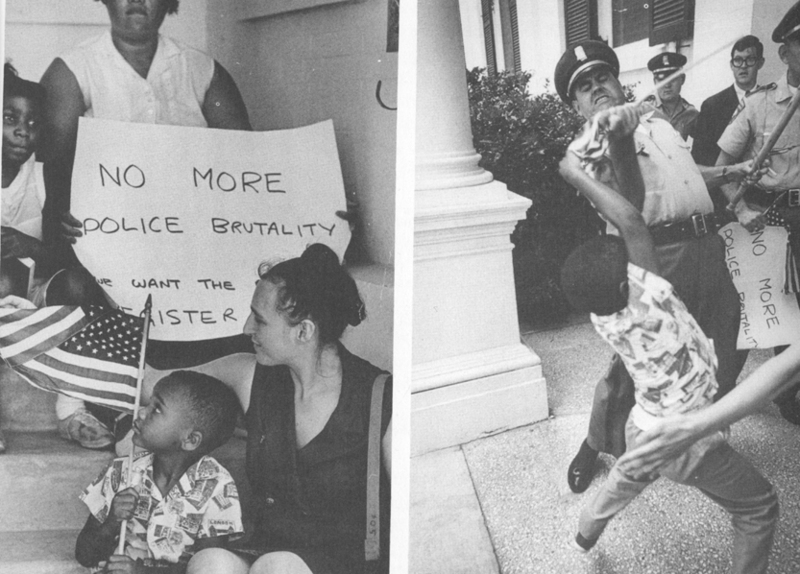 His refusal was a symbol of the courage of civil rights activists of all ages. The little boy grew up to become a high school teacher and college professor known as Dr. Wayne "Anthony" Quin.. His remarkable journey is described in his obituary below. Dr. Quin was born in McComb, Mississippi where he actively participated in the Civil Rights movement alongside his mother. After graduating from High School, Dr. Quin attended Jackson State University and eventually relocated to Tampa, Florida. After a successful career in sales and sales management, Wayne "Anthony" Quin began his teaching career with Hillsborough County Public Schools in 1997 after earning a Bachelor of Science degree in Behavior Disorders from the University of South Florida, Tampa Campus. Dr. Quin was a Charter Member of the Faculty at Blake High School for the Performing Arts. Dr. Quin specialized in Teaching Special Needs Students with Emotional Challenges. Dr. Quin was a founding member of the Blake Faculty Jazz Ensemble. Dr. Quin completed his Master of Arts degree in Varying Exceptionalities from the University of South Florida, Tampa Campus. During his tenure at Leto Senior High School, Dr. Quin served as a class sponsor and completed the Master of Educational Leadership degree from the University of South Florida, Tampa, Campus. Dr. Quin then became a Charter Faculty Member of the George S. Middleton High School staff and earned administrative experience working in the Office of Student Affairs while entering the doctoral program in Global Organizational Development at the University of South Florida. Dr. Quin conducted research and gave international presentations in Adult Education in Sweden, Finland and Russia. He earned the Doctor of Philosophy degree in Adult Education from the College of Education, University of South Florida, Tampa Campus in 2012. Dr. Quin was a leader in K-12 Education. Dr. Quin's dedication and concern for enhancing the education of children was evident in his career. Dr. Quin's exceptional expertise in Education was clearly demonstrated by serving as a Department Head in Special Education, School Administrator at every level of K-12 education which included elementary, middle, secondary, and adult levels. Dr. Quin served as Principal of Central City Elementary School, Assistant Principal for Administration at Gary Adult High School, Assistant Principal at both Burns Middle School and King Senior High School. Dr. Quin was a member of the Assistant Principal I Council having served as Area Representative, Member-at-Large, Chair-Elect and twice elected Chairman of the Assistant Principal Council 1 Council for the Hillsborough County Public School System. Dr. Wayne Anthony Quin leaves to cherish memories of him a loving and devoted wife, Dianna Allen-Quin, Twins, Wayne Anthony, II and Brianna Nevaeh. Dr. Quin was a Member of the Deacon Board at Beulah Baptist Institutional Church, Tampa, Florida. Deacon Quin served his church as the liaison of the Ministry for Young Adults, interim Chair of the Public Relations Ministry, a member of the Music Ministry, Church Advisory Board, and Adult Dance and Drama Ministry. Dr. Quin was also a member of the Alpha Phi Alpha Fraternity, Incorporated and a former executive board member of the Tampa/Hillsborough County Chapter of the NAACP. In his spare time he enjoyed spending time with his family, traveling, playing music, and studying the Martial Arts.